Greenhouse gas and other environmental concerns have been a major public concern for at least two generations. We know our civilization has a major impact on the planet’s ecosystem(s). We know that our technology produces a lot of waste products that cause a lot of damage to the natural world. But there is some confusion over which technology and which materials cause the damage. It is well understood that trees absorb a lot of carbon dioxide gas, and that this reduction of carbon dioxide gas greatly helps the environment. But it would be too easy to conclude that cutting down trees is causing environmental ruin. The reality is more complex. Growing new trees helps reduce Carbon dioxide. But once a tree is fully grown it absorbs and releases Carbon dioxide in about equal amounts. If we continually grow new trees and new forests we pull a lot of carbon dioxide out of the atmosphere. But it we just leave trees standing we neither contribute nor remove and Carbon dioxide. The trick is to continually grow new trees, and then use their timber for building. The carbons dioxide gas stored in timber will remain there so long as the wood is not burnt. Building with timber is environmentally friendly, provided that we continually plant new trees. Bamboo grows very quickly. It is technically a grass not timber, but it can effectively be used to produce very durable building materials. 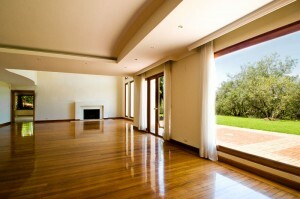 Good bamboo rivals hardwood for flooring materials. It is possible to grow good bamboo in 6 years. Good timber requires several decades to fully mature. This means we can produce good building material from bamboo, and help the environment by planting more bamboo, all in a fairly short time frame.